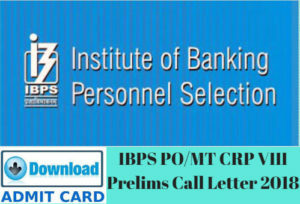 The Institute of Banking Personnel IBPS is to issue the Admit cards/Call Letter/Hall Tickets for the Preliminary Online Examination for the posts of Probationary Officer/Management Trainee – VIII very shortly at the official website. The aspirants who have applied for the IBPS PO/MT – VIII those aspirants will have to require to wait some more time. Their call letters for the Prelims examination will be uploaded on the official website. The Institute of Banking Personnel IBPS examination of Preliminary IBPS PO – VIII, 2018 & will be commenced very shortly. As according to our analysis we expect that the admit cards for the IBPS PO MT VIII, 2018 will be uploaded shortly. The candidates will be then able to download the admit cards/call letter from the official website. The result of the preliminary examination will be declared after the one or two weeks of the complement of the examination and the information of the same will be stated here also. First of all visit to the official website of IBPS. 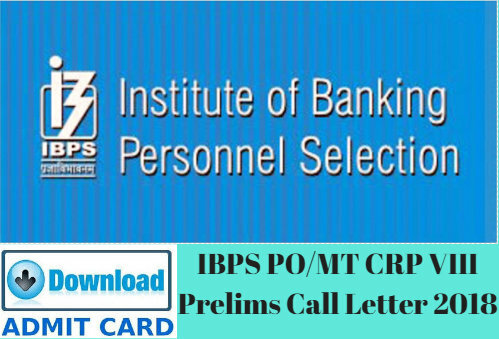 Search for the link of “IBPS PO – VIII, 2018 Call Letters”. Enter the details of Registration Number and Date of Birth or Password. And after it click on the submit button. Your admit card will be open. Take a print of it for future references. The candidates who will be qualified in the Prelims examination will be called for the main examination. The Main examination of the IBPS PO – VIII, 2018 is scheduled to be conducted soon and the admit cards/call letters for the Main examination will be uploaded at the official website of IBPS for the Main Examination before one week of the commencement of Main Examination. We would like to tell to our visitors that we will confer all the details regarding this post like Results, Call Letters, Interview and final merit list.